The Korean War refers to a period of military conflict between North Korea (officially the Democratic People's Republic of Korea) and South Korea (officially the Republic of Korea) regimes, with major hostilities lasting from June 25th, 1950 until the armistice signed on July 27th, 1953. The conflict arose from the attempts of the two Korean powers to re-unify Korea under their respective governments. The period immediately before the war was marked by escalating border conflicts at the 38th Parallel and attempts to negotiate elections for the entirety of Korea. These negotiations ended when the North Korean Army invaded the South on June 25th, 1950. Under the aegis of the United Nations, nations allied with the United States intervened on behalf of South Korea. 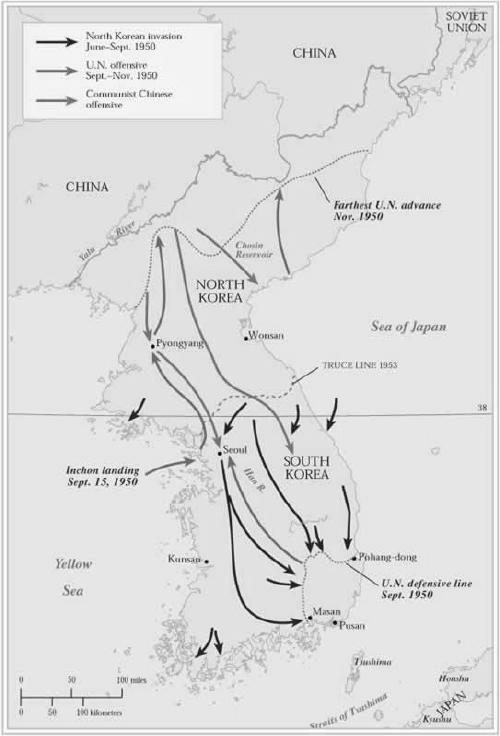 After rapid advances in a South Korean counterattack, North-allied Chinese forces intervened on behalf of North Korea, shifting the balance of the war and ultimately leading to an armistice that approximately restored the original boundaries between North and South Korea. The spectacular MiG-15 fighter used a combination of Russian ingenuity and "borrowed" advanced European aviation technology to become one of the most famous aircraft designs of its era. Called the "aircraft-soldier" by Russian pilots, the aircraft was exceptionally strong and dependable. The Grumman F9F Panther was the manufacturer's first jet fighter and the U.S. Navy's second. The Panther was the most widely used U.S. Navy jet fighter of the Korean War. It flew 78,000 sorties and was responsible for the first air kill by the US Navy in the war - the downing of a North Korean Yakovlev Yak-9 fighter. The Douglas A-26 Invader (B-26 between 1948-1965) was a United States twin-engined light attack bomber built by the Douglas Aircraft Co. during World War II that also saw service during several of the Cold War's major conflicts. Its gull-wing shape made it instantly recognizeable. Its characteristic sound while in an attack dive led the Japanese to call it "The Whistling Death." Combined with its high speed, agility and toughness, the Vought F4U Corsair was one of the finest fighters ever built. Originally thought to be too powerful to fly from a carrier, the Corsair weaved a path of destruction in battle after battle during WWII, totally outclassing the much-feared Zero.